The archetypical Puerto Rican side dish. It’s served at breakfast with eggs and ham, at lunch, or with the evening meal whatever the entrée. It’s just plantains, sliced, and deep fried. In Puerto Rican cooking, we fry the slices twice after pressing then to form the patties. In other parts of the Caribbean, notably Jamaica, the slices are deep-fried just once. They are not pounded and re-fried. I have tried tostones this way, but it just doesn’t come out the same. Those who follow our method can acquire what is called a tostonera in any Latino market. This consists of two pieces of wood or plastic that hinge over to enclose and flatten the plantain slices. Here, again, I defer to tradition. I’ve tried these newfangled contraptions and fond them wanting. Nothing beats the plantain peels and the flat of the hand for forming genuine tostones. To remove skin from the plantain, cut tips at both ends, cut a slit along the length of the plantain and peel off. To facilitate easier handling, some cooks dip plantains in hot water for 5 minutes and then remove the skin. Once plantains are peeled, cut into diagonal slices about 1 inch thick. Reserve peels: typically, the unbroken skin of the plantain is used for flattening the tostones. Combine water and salt in a bowl and soak plantain slices for 30 minutes. Drain well. Fill a cast iron or heavy bottomed skillet halfway with vegetable oil. Heat oil until very hot (375 degrees F.). Deep fry for 4-5 minutes. Remove with slotted spoon and drain on paper towels. Place a plantain slice between two plantain peels, envelope fashion, and pound flat with the palm of the hand. Repeat until all slices are pressed. Return plantain slices to skillet and cook until golden brown (about 4 minutes longer). Drain on absorbent paper towels and sprinkle lightly with salt. Yield: 12 to 18 tostones. 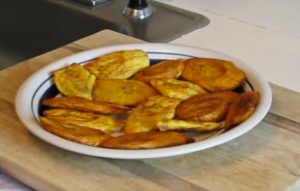 Puerto Rican cuisine in this video: Fried Green Plantains also known in the Caribbean / Latin American communities as Tostones.